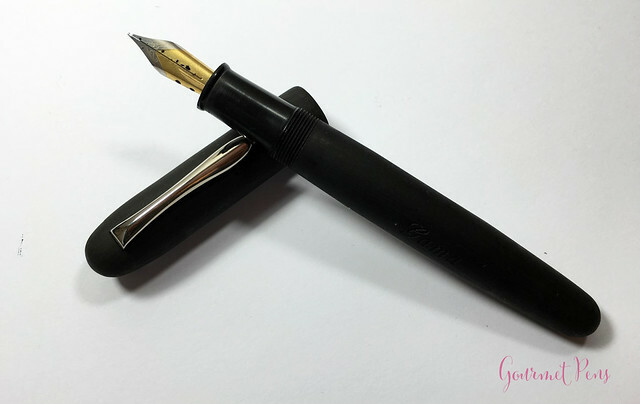 Thanks to Fountain Pen Revolution for sending this Gama Hawk fountain pen for review! It even has a flex nib, which I am most excited about. What would I use this pen for? A giant eyedropper with a flex nib that I can be rough with - I wouldn't be too worried about what inks I put in this (i.e hard to clean ones or boutique inks would all be fair game). It wouldn't be a nib I expect to keep forever - I expect to wreck the nib at some point, so it will need replacing. Fortunately, it is (relatively) inexpensive to replace. None, just the way I like it! 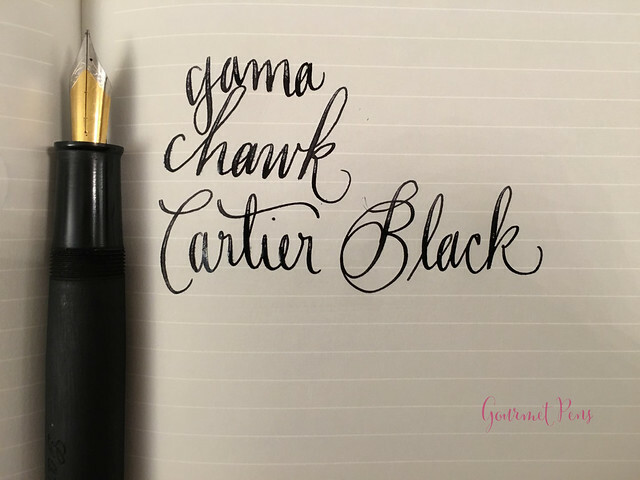 The Gama Hawk is a large, simple black pen. It has a round cap and barrel, and it tapers slightly towards the back end, with rounded ends. The finial is just a rounded top with no markings. The clip is attached internally, under the cap top. The seam is visible around the top of the cap, but there are no major gaps that make me think this lacked attention. The clip is plain, and reminds me of Pelikan's pelican bill clip - it is similarly shaped and has no markings on it. There is a small vent hole in the cap - clean cut and it doesn't look bad to me. The cap, section, and barrel are all a black ebonite. The cap and barrel are a matte, brushed black. The barrel is engraved with GAMA. I would prefer a g or something on the finial to mark the brand instead of this giant engraving on the barrel - something a little more subtle, but I imagine this is more cost effective. 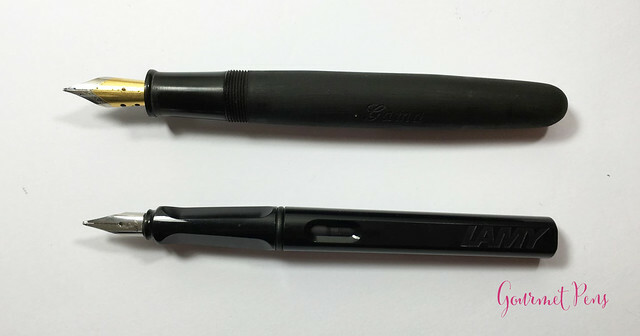 The section is round and smooth black ebonite, tapering slightly towards the nib and ending in a hard ridge before the nib. The cap threads are at the back of the section. 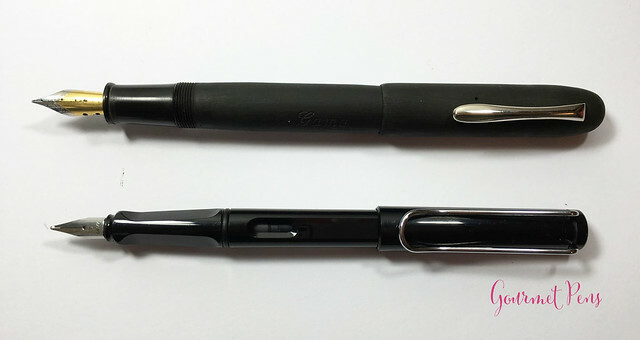 This is a pretty cool looking pen - it's large, and although simple, it looks cool - probably because of the size. I'm not crazy about the brushed look; I prefer a smooth finish, but I like the shape. It's a cool name, and not ugly or anything. The brushed finish doesn't put me off completely. This #35/#6 two-tone steel nib is an upgraded nib available at FPR. 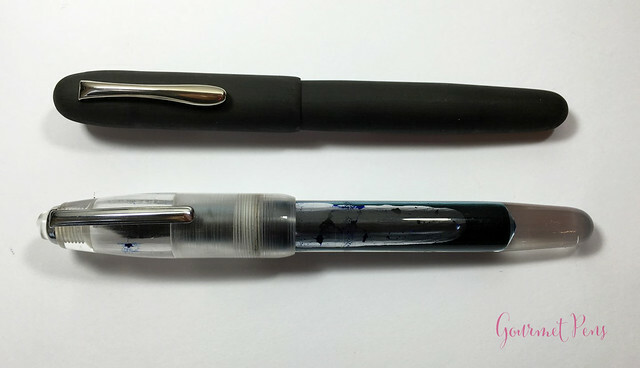 It has a single slit that runs half the length of the nib, and no breather hole. 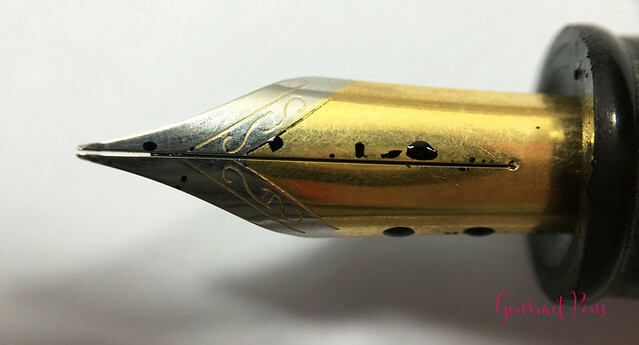 Other than a few simple flourishes, there are no other markings on the nib. This nib and feed should be thoroughly flushed with water, then some dilute dish soap, then water again, then heat set for optimal ink flow. (I have gone into a little more description than just saying "flush" because if you are a new reader and unfamiliar with this notion, you might think I'm nuts.). Flushing and heat setting will remove machining oils from the nib and feed, and heat setting will give your feed the best shape to the nib so ink will move best. As you can see from this image, the tines were a little too far apart - the nib and feed were realigned and heat set, and the tines were then properly aligned. The nib offers some feedback but is not scratchy. I enjoy this nib more than the flex nib on the Gama Popular, which had hard starts and some skips. 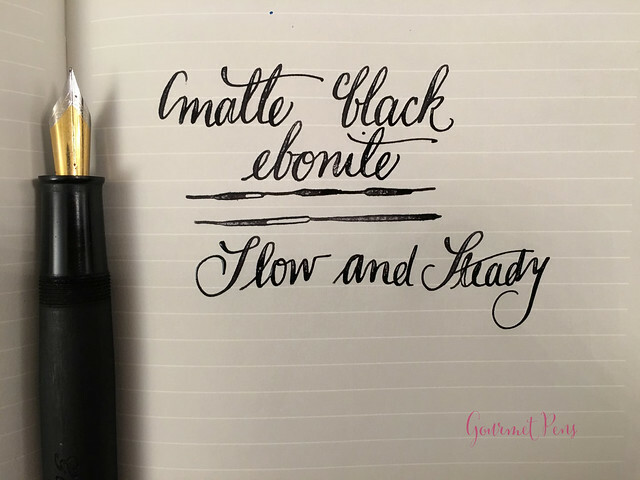 This one does not hard start or skip, and ink flow is consistent and reliable. Without pressure, the nib writes a fine line. With moderate pressure, you can experience the flex capabilities and line variation. I find this nib pleasant and enjoyable to use. It's a solid writer, and it's fun to play around with. It bounces back quickly after applying pressure - but if you apply too much pressure, the tines may spread too far and it will be misaligned. They can be realigned pretty easily as this steel is relatively soft, but this can be avoided by just paying attention to your angle and pressure when using this nib. Or any flex nib, for that matter. 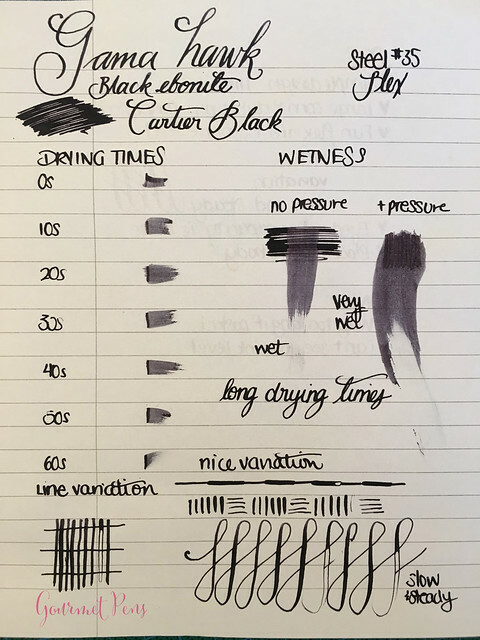 Ink flow picks up right away, even after sitting around for a few days, so the feed doesn't dry out too easily. This is a good thing - given the large ink capacity! I like this clip. The shape makes it pretty easy to slide on to papers, and into pockets and pen cases. It's nice, springy, and easy to operate one-handed. The section is smooth and round, and just a little on the thick side to be 100% comfortable for me, but it isn't a deal breaker because this isn't my holy grail kind of pen. The threads are quite smooth to the touch. The ridge at the end of the section is very hard and of course, this is right where I tend to grip. It's the spot where I have the most control over the pen and nib. Not ideal for long writing sessions, but best for uniformity/consistency of my handwriting. Unposted, the pen is a comfortable, usable length, and it is well-balanced.I find it a little on the girthy side. The cap can be posted securely by friction. For me, the pen becomes too long and top heavy, so I prefer using it unposted. The only advantage is that I can grip a little higher, off that hard ridge. I can't use it posted for long writing sessions - my hand gets tired. 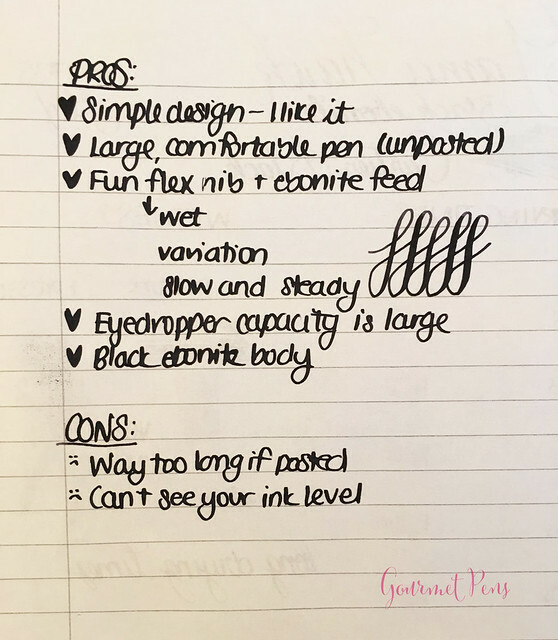 I also have a hard time controlling the pen for uniform writing because of the length and balance pulling towards the back. This is a great pen to experiment with. I enjoy the fun line variation offered by the flex nib. I wouldn't use it for every day writing because I find it a little plain and too big, but the large size is great for eyedropper mode with that flex. I love the ebonite feed, and the smell of the ebonite itself. It's a nice, relatively affordable way to dabble with flex pens, and to use any sort of fountain pen inks, even those hard to clean ones. It also doesn't fit in most of my pen cases, so I have to keep it around my desk area if I want to use it. With a Gama Jumbo Acrylic. This pen was sent for review. I was not compensated monetarily for this review. All opinions are my own. No affiliate links.